Healthy trees begin with healthy soils. Here at Ethical Arboriculture, we believe that to get to the root of a trees problems then you’ve got to start at the bottom and that plant health care should improve the environment that it lives. By optimising the soil a tree can grow to its full potential and defend itself from pests and diseases or withstand the effects of environmental changes. Plant health care is not a one size fits all. Different tree species have a wide range of soil requirements. We start with a simple set of soil tests, to determine the Ph, nutrient and compaction levels. From there we can begin a tailored solution, specific to your site and soil requirements. We offer a wide range of different solutions for decompacting soils, ranging from our simple soil auger, through to compressed air injection beneath the ground level. This can alleviate localised flooding by allowing air, water and nutrients to penetrate and freely flow through the soil, rather than rapidly running off the surface and increasing demand on surface water drainage. Nutrient rich organic material can be incorporated into the soil using our air spade, providing a natural soil amendment, with the added benefit of decompacting the trees rooting area. 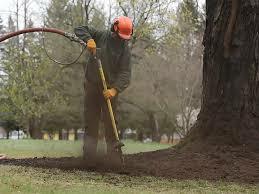 By improving the soil we can increase the trees resilience to pest and disease and reduce the need for chemical usage. A layer of pure mulch can then be spread over the trees rooting area, creating conditions similar to a forest floor, reducing the chances of compaction and drought related issues, while providing a steady flow of nutrients as the mulch is broken down into the soil. 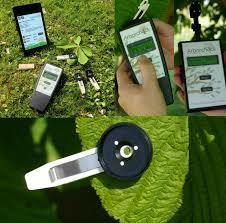 Using our Arborcheck system we can test a trees current vitality levels, and assess them against a benchmark. This gives us a true representation of the trees current health, giving pre-visual results that normally aren’t visible to the naked eye. This also gives us the ability to show the positive results of our work in both the short and long term. Results of these tests can be produced as a stand alone documents or included into reports.